"Chinese Taipei" is the name for Taiwan designated in the Nagoya Resolution whereby the Republic of China (ROC) and the People's Republic of China (PRC) recognize each other when it comes to the activities of the International Olympic Committee. The ROC participates under this name in various international organizations and events, including the Olympic Games, the Little League World Series, International Tennis Federation sanctioned tournaments, the Australian Open, the French Open, Wimbledon, the US Open, Paralympic Games, Asian Games, Asian Para Games, Universiade, International Powerlifting Federation, FIFA, the World Kendo Championship, the Overwatch world cup and other eSports, Miss Universe, Miss Chinese International Pageant, FIRST Global, the Metre Convention, and the World Health Organization. The term is deliberately ambiguous. To the PRC, "Chinese Taipei" is ambiguous about the political status or sovereignty of the ROC/Taiwan; to the ROC, it is a more inclusive term than just "Taiwan" (which the Kuomintang political party of the ROC, in power at the time, considers just one part of "China", which it, similarly to the PRC, claims to be the rightful government of "China" in its entirety, and to the PRC the use of "Taiwan" as a national name is associated with independence of the area from the PRC) and "Taiwan, China" might be construed as a subordinate area to the PRC. Before the 1600s, the island of Taiwan had numerous independent Taiwanese Aborigines tribes, before suffering colonization by the Dutch and Spanish colonizers in the northern areas. Small portions of Taiwan were colonized by the Chinese and these few southern areas were governed by the Kingdom of Tungning before being annexed by the Qing dynasty in 1683. The central and mountainous areas were still under Indigenous control. Following the First Sino-Japanese War in 1895, Taiwan was annexed by Japan. After the Surrender of Japan at the end of World War II, the island of Taiwan was placed under the administration of Nationalist Republic of China (ROC) in 1945 and became their newest province. Near the end of Chinese Civil War in 1949, before the post-war treaties were to be signed, the Kuomintang were driven out of the mainland by the Communists who would later establish the People's Republic of China (PRC) in October 1949. The then ruling-party Kuomintang, however, retreated to the occupied Taiwan, thus becoming government in exile and remained for a time as the internationally recognized government of the Republic of China. Most democratic countries (including the United States) initially continued to support the Nationalist government while communist nations recognized the Communist government. As time went on, the increased official recognition of the PRC in international activities, such as when accorded recognition in 1971 by the United Nations, instead of that accorded previously to the ROC saw previously existing diplomatic relations transfer from Taipei to Beijing. The ROC needed to come to a beneficial conclusion to how it would be referred when there was in the same forum participation by the PRC. The International Olympic Committee (IOC), had informally been using in international Olympic activities a number of names to differentiate the ROC from the PRC. "Taiwan" was used at the Tokyo Games. In 1979, the PRC agreed to participate in IOC activities if the Republic of China was referred to as "Chinese Taipei". The Nagoya Resolution sanctioned that the Beijing Olympic Committee would be called the "Chinese Olympic Committee" and another name would need to be found for the ROC Olympic Committee (ROCOC). The majority view of the ROC leadership at the time was that they did not want to change, "Taiwan" might imply without China or Chinese being in the name subordination to the PRC, did not represent all the regions/islands of the ROC and did not give the ROC an opportunity to assert when wanted a claim to territory outside of the ROC. What people refer to as Taiwan is one of several areas or islands (Penghu, Kinmen and Matsu in addition to Taiwan) and Taiwan alone did not reflect the "territorial extent" of the ROC. Furthermore, although it is true that most products from the area controlled by the ROC are labeled "made in Taiwan", the trade practices of the ROC are such that the regional area of production is used for labeling. Some wines from Kinmen are labeled "made in Kinmen", just as some perfume is labeled "made in Paris" and not "made in France". Taiwan's own government, the ROC government under the Kuomintang (KMT), rejected the designation of "Taiwan, China" on the grounds that this would imply subordination to the PRC. However, it also refused the names "Taiwan" and "Formosa (simplified Chinese: 福尔摩沙; traditional Chinese: 福爾摩沙)" as a means of reasserting both its claim as the only legitimate government of all of China, and its uncompromising rejection of Taiwan independence. Instead, deriving from the name of its capital city, the ROC government finally formulated the name “Chinese Taipei,” instead of accepting the offer of “Taiwan,” because “Chinese Taipei” signified an uncertain boundary that could exceed the ROC’s actual territory of control of Taiwan, Penghu, Kinmen and Matsu, whenever the ROC government wished to assert it. It regarded the term Chinese Taipei as both acceptably neutral and hopeful of assent from other interested parties. Its proposal found agreement. Beijing accepted the compromise position that the ROC Olympic Committee could be named the "Chinese Taipei Olympic Committee". According to the Olympic Charter, only one Chinese Olympic Committee should be recognized. In consideration of the athletes in Taiwan having an opportunity to compete in the Olympic Games, the sports constitution in Taiwan could function as a local organization of China and still remain in the Olympic Movement in the name of the Chinese Taipei Olympic Committee. However, its anthem, flag and constitutions should be changed correspondingly. In November 1979, in Nagoya, Japan, the International Olympic Committee, and later all other international sports federations, adopted a resolution under which the National Olympic Committee of the ROC would be recognized as the Chinese Taipei Olympic Committee, and its athletes would compete under the name Chinese Taipei. The National Olympic Committee of the ROC boycotted the Summer and Winter Games in protest of not being allowed to use the Republic of China's official flag and national anthem. The name "Chinese Taipei" was formally accepted by the Government of the Republic of China in 1981. A flag bearing the emblem of its Olympic Committee against a white background as the Chinese Taipei Olympic flag was confirmed in January 1981. The agreement was signed March 23 in Lausanne by Shen Chia-ming, the President of Chinese Taipei Olympic Committee, and Juan Antonio Samaranch, the President of the IOC. In 1983, the National Flag Anthem of the Republic of China was chosen as the anthem of the Chinese Taipei delegation. The Republic of China has competed under this flag and name exclusively at each Games since the 1984 Winter Olympics, as well as at the Paralympics and at other international events (with the Olympic rings replaced by a symbol appropriate to the event). Both the Republic of China (ROC) and the People's Republic of China (PRC) agree to use the English name "Chinese Taipei". This is possible because of the ambiguity of the English word "Chinese", which may mean either the state or the culture. In 1979, the International Olympic Committee passed a resolution in Nagoya, Japan, restoring the rights of the Chinese Olympic Committee within the IOC, meanwhile renaming the Taipei-based Olympic Committee "Chinese Taipei Olympic Committee". Since then, and until 1989 the PRC translated "Chinese Taipei" as "Zhongguo Taipei" (simplified Chinese: 中国台北; traditional Chinese: 中國臺北; pinyin: Zhōngguó Táiběi), similar to "Zhongguo Hong Kong", connoting that Taipei is a part of the Chinese state. By contrast, the Republic of China government translated it as "Zhonghua Taipei" (simplified Chinese: 中华台北; traditional Chinese: 中華臺北; pinyin: Zhōnghuá Táiběi) in Chinese, which references the term "China" as the cultural or ethnic entity, rather than the state. In 1981 the former Republic of China Olympic Committee confirmed its acceptance of the Nagoya resolution, but translated "Chinese Taipei" to "Zhonghua Taipei". In 1989, the two Olympic committees signed a pact in Hong Kong, clearly defining the use of "Zhonghua Taipei". The PRC had been observing the Hong Kong pact and using "Zhonghua Taipei" in stipulated areas ever since, but on other occasions, the version of "Zhongguo Taipei" was still in use following past practice, especially in official media references. In the London 2012 Olympic Games opening ceremony, when each country's team proceeds in alphabetical order in English (the host country's language), the Chinese Taipei (TPE) team did not follow China (CHN), but instead took a place in the procession as if its name were "Taipei" or Taiwan, following Syria and preceding Tajikistan instead. In Beijing 2008 it followed Japan and preceded the Central African Republic. This ordering was based on the stroke number and order of each team's name in simplified Chinese, the official script in the PRC. Other East Asian nations have also had to make unique translation decisions. In Japan, the PRC is referred to by its official Japanese name Chūka Jinmin Kyōwakoku (中華人民共和国), but an English transliteration, Chainīzu Taipei (チャイニーズタイペイ), is used for Chinese Taipei. While in South Korea, the PRC is referred to by its official Hanja name Junghua Inmin Gonghwaguk (중화인민공화국) or (中華人民共和國 in Hanja), whereas Chinese Taipei is referred to as Junghua Taibei (중화 타이베이), which is very similar to the Chinese transliteration. The name "Chinese Taipei" has spilled into apolitical arenas. The PRC has successfully pressured some religious organizations and civic organizations to refer to the ROC as "Chinese Taipei". The Lions Club used to refer to the Republic of China as "Chinese Taipei", but it now uses the name "Taiwan MD 300". Both the International Monetary Fund and the World Bank refer to the Taiwan as "Chinese Taipei", and "Taiwan" does not appear on the member countries list of either organization. The ICSU also refers to the Republic of China as "China Taipei", right below "China CAST". The Republic of China is a member economy of APEC, and its official name in the organization is "Chinese Taipei". It has also participated as an invited in the World Health Organization (WHO) under the name Chinese Taipei. It is the only agency of the United Nations that the ROC is able, provided it is invited each year, to participate in since 1971. In the Miss World 1998, the government of the People's Republic of China pressured the Miss World Organization to rename Miss Republic of China 1998 to "Miss Chinese Taipei"; it has been competing ever since under that designation. The same happened in 2000, but with the Miss Universe Organization. Three years later at the Miss Universe pageant in Panama, the first official Miss China and Miss Taiwan competed alongside each other for the first time in history, prompting the PRC government to again demand that Miss Taiwan assume the title "Miss Chinese Taipei". The contestant in question, Chen Szu-yu, was famously photographed holding her two sashes. Today, neither Miss Universe nor Miss World, the two largest pageant contests in the world, allow Taiwan's entrants to compete under the Taiwan label. In 2005, the third largest pageant contest, Miss Earth, initially allowed beauty contestant Li Fan Lin to compete as "Miss Taiwan"; a week into the pageant, however, her sash was updated to "Taiwan ROC". In 2008, the official name for the ROC, was changed to "Chinese Taipei". The title "Chinese Taipei" leads some people to believe that "Taipei" is a country. During the 2004 Summer Olympics in Athens, while Chinese and Taiwanese news channels referred to the team as Chinese Taipei, most foreign outlets simply called the team Taiwan. For sporting events, the ROC team is abbreviated in Taiwan as the Zhonghua Team (中華隊; Zhonghua being a more cultural rather than political variation of the term China), which, in effect, labels it the "Chinese Team", in the sense of a "team that is of Chinese ethnicity" as opposed to a "team from China". Starting around the time of the 2004 Summer Olympics, there has been a movement in Taiwan to change all media references to the team to the "Taiwanese Team", and the mainstream Taiwan Television (TTV) is one of the first Taiwanese media outlets to do so. Such usage remains relatively rare, however, and other cable TV channels currently refer to the ROC as the Zhonghua Team and the PRC as the Zhongguo Team, the China team or the mainland China team. In the 2005 International Children's Games in Coventry, United Kingdom as well as the National Geographic World Championship, the name Chinese Taipei was used too. Chinese Taipei was also the term used by Major League Baseball for the Taiwanese teams that participated in the World Baseball Classic competitions in 2006, 2009, 2013, and 2017, competing under the Chinese Taipei Olympic flag. The Little League World Series also refers to the Taiwanese teams as Chinese Taipei (although the uniforms states Asia-Pacific). Tennis players play for teams using the Chinese Taipei name and olympic flag in national competitions such as the Davis Cup, Fed Cup and Hopman Cup. Use of the label came under vigorous renewed criticism during the run-up to the 2017 Summer Universiade, hosted in Taiwan. Changing demographics and opinions in the country mean that more than 80% of citizens now see themselves as Taiwanese, not Chinese whereas in 1991 this figure was only 13.6%. This radical upswell in Taiwanese national identity has seen a re-appraisal and removal of "sinocentric" labels and figures established by the government during the period of Martial Law. Moved by a desire to use the country's own national flag and anthem this has included ridiculing the term "Chinese Taipei" not only in the national and international press but by Taiwanese legislators; New Power Party (NPP) Executive Chairman Huang Kuo-chang in particular lambasted the English-language guide to the Universiade for its "absurd" use of the label, illustrating this with statements extracted from the guide rendered nonsensical by their author's insistence on completely avoiding the name "Taiwan" not only when referring to the label under which Taiwanese athletes compete, but even when referring to geographical features such as the island of Taiwan itself. These statements included "Introduction of our Island: [...] Chinese Taipei is long and narrow that lies north to south [sic]," and "Chinese Taipei is a special island and its Capital Taipei is a great place to experience Taipei's culture." Huang added sarcastically, "Welcome to Taipei, Chinese Taipei!" In response, the guide was withdrawn and shortly thereafter re-issued with the designation "Taiwan" reinstated. The Department of Information and Tourism's division chief explained that Taipei Mayor Ko Wen-Je originally wrote "Taiwan" throughout his introduction of the guide, but that it was changed to "Chinese Taipei" by the International University Sports Federation (FISU) during their review of the document. Due to the public outcry over the controversy, the re-issued "Taiwan" guide was sent for printing without waiting for the response of the FISU. Taiwan's Social Democratic Party (SDP) member Miao Po-Ya separately criticized the FISU's indiscriminate substitution of "Taiwan" with "Chinese Taipei", pointing out that the "Olympic model" does not prohibit the use of "Taiwan" and citing the example of the 2009 Kaohsiung World Games, in whose material Taiwan was referred to extensively by name, and as a country, without issue. Miao also claimed that the FISU had also asked organizers to change "Taiwan" to "Chinese Taipei Island" and "New Taiwan Dollar" to "Chinese Taipei Dollar", suggesting that FISU Vice President Liguo Yang (who is also Secretary-General of the Federation of University Sports of China, which is under the control of the Chinese Communist Party) and Xue Yangquing (member of the Federation's media and communication committee) might have exerted China's political influence over the ostensibly non-partisan FISU to downplay Taiwan's national status. Despite these corrections, hundreds of Taiwanese demonstrated in Taipei, demanding that Taiwan cease using "Chinese Taipei" at sporting events. In a bid to raise international awareness demonstrators unfurled huge banners reading, in English, “Taiwan is not Chinese Taipei” and “Let Taiwan be Taiwan”. In an apparent error, the re-issued guide still contained a passage reading, "Bravo the Bear, the Universiade mascot, is based on the Formosan black bear, a species endemic to Chinese Taipei." However, the Taiwanese people voted during a referendum in November 2018 to reject a proposal to change their official Olympic-designated name from Chinese Taipei to Taiwan. The main argument for opposing the name change was worrying that Taiwan may lose its Olympic membership under Chinese pressure, which would result in athletes unable to compete in the Olympics. References used in the international context to refer to the Republic of China or Taiwan differ according to the type of the organization. The World Trade Organization officially uses "Separate Customs Territory of Taiwan, Penghu, Kinmen, and Matsu" for the Republic of China, but "Chinese Taipei" is frequently used in official documents and elsewhere. International organizations in which the PRC participates generally do not recognize Taiwan or allow its membership. The ROC is recognized by 16 UN member states and the Holy See. Thus, for example, whenever the United Nations makes reference to Taiwan, which does not appear on its member countries list, it uses the designation "Taiwan, Province of China", and organizations that follow UN standards usually do the same, such as the International Organization for Standardization in its listing of ISO 3166-1 country codes. Certain web-based postal address programs also label the country designation name for Taiwan as "Taiwan, Province of China". Inter-governmental organizations use a variety of terms to designate Taiwan. In a rare reversal of this tendency, the PRC's state news agency, Xinhua, in July 2017 issued a style guide prohibiting the use of "Taiwan Province" in favor of the preferred name "Taiwan" or "Taiwan Area". Its reason for doing so was ostensibly to "[take] into account the psychological feelings of Taiwanese." President Chen Shui-bian (far left) who attended the funeral of Pope John Paul II was seated in the first row in French alphabetical order beside the then first lady and president of Brazil. Some non-governmental organizations which the PRC does not participate in continue to use "China" or the "Republic of China". The World Organization of the Scout Movement is one of few international organizations that continue to use the name of "Republic of China", and the ROC affiliate as the Scouts of China. This is because such Scouting in Mainland China is very limited or not really active. Likewise, Freemasonry is outlawed in the PRC and thus the Grand Lodge of China is based in Taiwan. Countries that maintain diplomatic relations with Taiwan, especially the ROC's older diplomatic affiliates, also refer to the ROC as "China" on occasion; for example, during the funeral of Pope John Paul II, the President of the Republic of China, Chen Shui-bian, was seated as part of the French alphabetical seating arrangement as the head of state of "Chine" between the first lady of Brazil, and the president of Cameroon. Taiwan is categorized in the United Nations population projections as "Other non-specified areas" within East Asia. ^ a b c d e f Catherine K. Lin (August 5, 2008). "How 'Chinese Taipei' came about". Taipei Times. ^ Eyal Propper. "How China Views its National Security," Archived 25 March 2012 at the Wayback Machine The Israel Journal of Foreign Affairs, May 2008. ^ Brian B. Pendleton, "The People's Republic of China and the Olympic Movement: A Question of Recognition," Unpublished Doctoral dissertation, The University of Alberta, 1978, p. 115. ^ a b Liu, Chin-Ping (2007). 1981年奧會模式簽訂之始末 (PDF) (in Chinese). Archived from the original (PDF) on March 9, 2012. Retrieved July 8, 2010. ^ Chao, Li-Yun (November 2, 2001). 「中華台北」會籍名稱使用事略 (in Chinese). National Policy Foundation. Archived from the original on July 24, 2011. Retrieved July 8, 2010. ^ "Winter Olympic Games Lake Placid, USA, 1980". Kiat.net. Archived from the original on June 17, 2012. Retrieved July 27, 2013. ^ However, the name of the committee in Chinese continues to be "中華奧林匹克委員會" ("Chinese Olympic Committee"): see Official Website. ^ Joe Hung (January 10, 2002). "Chinese Taipei". National Policy Foundation. Archived from the original on July 24, 2011. Retrieved July 9, 2010. ^ "Mainland plea to end Taiwan's name issue". China Daily. July 24, 2008. ^ "China clarifies Taiwan Olympics team name issue". New Ind Press. July 24, 2008. ^ "Taiwanese team will compete as 'Chinese Taipei', Beijing confirms". South China Morning Post. July 24, 2008. Archived from the original on July 16, 2011. ^ "Lions Club Locator". Lions Clubs International. November 11, 2008. Archived from the original on December 19, 2008. Retrieved November 22, 2008. ^ "IMF reports and publications arranged by country". International Monetary Fund. November 11, 2008. ^ "Member Countries & Regions of the World Bank". The World Bank. November 11, 2008. ^ "ICSU National Unions". ICSU. 11 November 2008. Archived from the original on 29 January 2009. Retrieved 22 November 2008. ^ "APEC FAQ: Who are the members of APEC?". Asia Pacific Economic Cooperation. November 11, 2008. Archived from the original on May 11, 2008. ^ Katie Rei d (May 18, 2009). "Taiwan hopes WHO assembly will help boost its profile". Reuters. Retrieved June 11, 2013. ^ "Miss World 2008 Contestants". Miss World. November 11, 2008. Archived from the original on July 2, 2014. ^ "Chen Szu-yu with her two sashes". ^ "Beauty queen renamed". Taipei Times. May 23, 2003. Retrieved August 9, 2012. ^ "85 Beauties Set Their Sights on 'Miss Earth 2008' Crown". Oh My News. November 11, 2008. ^ "Rest in peace, `Chinese Taipei'". Taipei Times. September 1, 2004. ^ "Taiwanese identity reaches record high". Taipei Times. May 28, 2016. ^ Chang, Rich (March 12, 2006). "'Taiwan identity' growing: study". Taipei Times. p. 3. ^ "Many Young Taiwanese Want to Go to the Olympics With a New Flag and Anthem". Time Magazine. November 11, 2016. ^ ""Taiwan is sick and tired of competing as 'Chinese Taipei' in global sporting events"". Quartz. August 8, 2017. ^ "NPP blasts 'absurd' English guide to Universiade". Taipei Times. August 9, 2017. ^ "UNIVERSIADE: 'Taiwan' back in English media guide". Focus Taiwan. August 11, 2017. ^ a b c "Taipei Universiade: 'Chinese Taipei' brochure slammed". Taipei Times. August 13, 2017. ^ "Taipei Universiade: Groups call for use of 'Taiwan' at Universiade". Taipei Times. August 13, 2017. 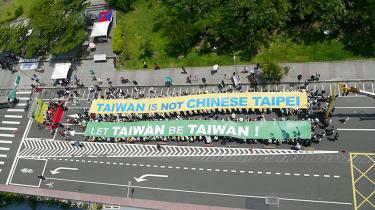 ^ "'Taiwan is not Chinese Taipei' and 'Let Taiwan be Taiwan' banners". Taipei Times. August 13, 2017. ^ "What's in a Name? For Taiwan, Preparing for the Spotlight, a Lot". The New York Times. August 16, 2017. ^ "The Latest: Taiwanese reject gay marriage, new Olympic name". The Washington Post. November 24, 2018. Retrieved November 29, 2018. ^ "MEMBER INFORMATION: Separate Customs Territory of Taiwan, Penghu, Kinmen and Matsu (Chinese Taipei) and the WTO". World Trade Organization. November 18, 2008. Retrieved July 27, 2013. ^ "United Nations Infonation". The United Nations. November 11, 2008. ^ "China forbids terms 'Formosa' and 'Republic of China'". Taiwan News. July 21, 2017. ^ Although such organizations are established in mainland, there is no or less governmental or CPC support to them. ^ Basten, Stuart (2013). "Redefining "old age" and "dependency" in the East Asian social policy narrative". Asian Social Policy and Social Work Review. ^ "2015 Revision of World Population Prospects". United Nations Department of Economic and Social Affairs. Swiss Residency Permits Refer the Nationality of ROC Citizens as "Chinese Taipei"
The Chinese Taipei Fed Cup team represents the Republic of China in Fed Cup tennis competition and are governed by the Chinese Taipei Tennis Association. They currently compete in the World Group II Play-offs. Chinese Taipei Football Association (CTFA) is the governing body for football in the Republic of China (commonly known as Taiwan). Its official name in Chinese is the Football Association of the Republic of China, but it is billed as the "Chinese Taipei Football Association" abroad and uses the English initials on its badge (see Chinese Taipei for details on the political reasons and issues related to the use of this sporting name for the Republic of China). The Chinese Taipei Open (formally the Chinese Taipei Open Grand Prix Gold) in badminton is an open international championships held in Taiwan since 1970s, but they took place only in irregular periods. Since 1980 they are regularly held, except in 1998, due to the Asian economic crisis, and 2001. Chinese Taipei (Taiwan) participated in the 2002 Asian Games held in Busan, South Korea, from September 29 to October 14, 2002. Athletes from Taiwan won overall 52 medals (including 10 golds), and clinched eighth spot in the medal table. The Chinese Taipei participated at the 16th Asian Games in Guangzhou, China. Chinese Taipei participated in the 2014 Asian Games in Incheon, South Korea from 19 September to 4 October 2014. Ten gold medals were won in weightlifting, taekwondo, cycling, karate, tennis, bowling, and golf. Chinese Taipei competed at the 2016 Summer Olympics in Rio de Janeiro, Brazil, from 5 to 21 August 2016. "Chinese Taipei" is the designated name used by Taiwan to participate in some international organizations and almost all sporting events, including the Olympic Games. Neither the common name "Taiwan" nor the official name "Republic of China" would be used due primarily to opposition from the People's Republic of China. This was also the nation's ninth consecutive appearance at the Summer Olympics. The Chinese Taipei Olympic Committee sent a team of 57 athletes, 26 men and 31 women, to compete in 18 sports at the Games. For only the third time in Olympic history, Chinese Taipei roster featured more female athletes than males. Among the sporting events represented by the nation's athletes, Chinese Taipei made its Olympic debut in equestrian jumping and golf (new to the 2016 Games), as well as its return to gymnastics, boxing, and wrestling after more than fifteen years. World-ranked tennis star Lu Yen-hsun, table tennis players Huang I-hua and London 2012 fourth-place finalist Chuang Chih-yuan, and trap shooter Lin Yi-chun highlighted the list of athletes to make the Chinese Taipei roster for their fourth Olympics. Apart from the veterans, twelve Taiwanese athletes previously competed in London, with weightlifter Hsu Shu-ching leading them as the only medalist to return for her second appearance in Rio de Janeiro. Other notable athletes from Chinese Taipei also featured world's top 30 golfers Candie Kung and Teresa Lu, and lone show jumper Isheau Wong, who eventually served as the nation's second female flag bearer in the opening ceremony (the first having done so in 2008).Chinese Taipei left Rio de Janeiro with only three medals (one gold and two bronze), a slight improvement on the team's performance at the previous Games. Among the medalists were the women's archery team (led by Tan Ya-ting, who eventually finished among the top eight in the individual recurve), and weightlifters Kuo Hsing-chun (women's 58 kg) and Hsu, who upgraded her silver from London to a golden finish in the women's 53 kg category. For the first time in history, Chinese Taipei did not obtain any medals in taekwondo, since the sport was officially added to the Olympic program in 2000. The Republic of China (commonly known as Taiwan) currently competes as "Chinese Taipei" at the Olympic Games. The ROC first participated at the Summer Olympic Games in 1932. After the Chinese Civil War the ROC retreated to the island of Taiwan and only Taiwan-based athletes have competed in its team since then. The ROC boycotted the Olympics starting from the 1976 Summer Games until it returned to the 1984 Winter Games, and started participating as Chinese Taipei. Due to pressure from the People’s Republic of China, since 1984, Taiwanese athletes have competed under the Chinese Taipei Olympic flag instead of the flag of the Republic of China. For any medal ceremony, the National Flag Anthem of the Republic of China is played instead of the National Anthem of the Republic of China. Taiwanese athletes won their first Olympic medal in 1960, and their first gold medal in 2004. The Republic of China (ROC) competes as Chinese Taipei at the Paralympic Games. The ROC first participated at the Summer Paralympic Games in 1992 and has competed in every summer games since then. The nation has never participated in the Winter Paralympic Games. Chinese Taipei has a special Paralympic flag which it uses during the games. The Chinese Taipei men's national basketball team is the men's basketball team representing the Republic of China on Taiwan in international competitions, organised and run by the Chinese Taipei Basketball Association (CTBA; Chinese: 中華台北籃球協會). Chinese Taipei's fourth-place finish at the 1959 FIBA World Championship is the second best finish of an Asian team at the World Championship, only behind the Philippines' third-place finish at the 1954 FIBA World Championship. The Chinese Taipei baseball team (Chinese: 中華臺北棒球代表隊; pinyin: Zhōnghuá Táiběi Bàngqiú Dàibiǎoduì) is the national team of Taiwan. It is governed by the Chinese Taipei Baseball Association. The team is ranked fourth in the world by the World Baseball Softball Confederation, behind the United States, Japan, and South Korea respectively. They have consistently maintained top positions in international baseball competitions. The team is usually made of professionals from Taiwan's Chinese Professional Baseball League, Japan's Nippon Professional Baseball, and Major League Baseball or Minor League Baseball from the United States. Due to hostile political pressures from Mainland China on international sports organizations, the delegation had to reach a compromise name, changing it from the National Baseball Team of the Republic of China (Chinese: 中華民國棒球國家隊; pinyin: Zhōnghuá Mínguó Bàngqiú Guójiāduì) to the Chinese Taipei Baseball Team.The team won six titles in the Asian Baseball Championship, a bronze medal at the 1984 Olympic Games in Los Angeles, and a silver medal at the 1992 Olympic Games in Barcelona. It won the gold medal at the 2006 Asian Games in Doha in a sweeping victory by beating South Korea, Thailand, China, Philippines, and finally all-time rival Japan. They achieved 8th place in the 2013 World Baseball Classic. The Chinese Taipei national football team is the official name given by FIFA to the national association football team of Republic of China. It is managed by the Chinese Taipei Football Association (CTFA, Traditional Chinese:中華民國足球協會), the controlling body for football in Taiwan. It is a member of the Asian Football Confederation's East Asian Football Federation. Despite never qualifying for the FIFA World Cup, Taiwan reached the semi-finals of the 1960 and 1968 AFC Asian Cups, finishing third in the former. The side also won gold in the football sector at the 1954 and 1958 Asian Games although the players in the team originated from British Hong Kong. This article details the fixtures and results of the Taiwan national football team. They played their first match in 1954. The Chinese Taipei national rugby sevens team is a minor national sevens side. They have competed in the Hong Kong Sevens since the 1980s. In 1989, veteran rugby commentator Bill McLaren mentions them in an article on the Hong Kong Sevens, saying that their team had two Chi-Mings, a Yen-Ching, and a Chijen-Shuen, and that he was grateful that he did not have to broadcast all the names, as he had trouble remembering them. The Chinese Taipei national rugby union team represents the Republic of China (Taiwan) in international rugby union. Chinese Taipei have yet to make their debut at the Rugby World Cup, but have attempted to qualify since Wales 1999. The Chinese Taipei women's national football team is the international women's football team for the Taiwan. The Chinese Taipei women's national volleyball team is the women's national volleyball team of Republic of China (Taiwan). (See Chinese Taipei for team naming issue) Controlled by Chinese Taipei Volleyball Association, it represents the country in international competitions and friendly matches. After 16 years since 1990, Chinese Taipei women's national volleyball team re-entered FIVB Volleyball Women's World Championship in 2006. To everyone's surprise, the 23-ranked team gained their first-ever victory over the host Japan (7th) on the opening day, followed by defeated South Korea (8th), Poland (9th), Kenya (11th), and Costa Rica (33rd) in the first round. However, after a good start of five consecutive victories, the team could not continue their impressing form and eventually took the 12th place. In December, the same squad attended the 2006 Asian Games held in Doha, Qatar. Although the team lost to South Korea and China in the preliminary round, they later beat Kazakhstan and Thailand and won the bronze medal, the first ever medal in women's volleyball at Asian Games. Chou Tien-chen (Chinese: 周天成; born 8 January 1990) is a badminton player from Taiwan, representing Chinese Taipei. In 2016 he became the first local shuttler in 17 years to win the Chinese Taipei Open Grand Prix Gold men’s singles title since Indonesian-born Fung Permadi won it in 1999. He won his first BWF Super Series title at the 2014 Yonex French Open, beating Wang Zhengming of China 10-21, 25-23, 21-19 in the finals. He is the record holder of three consecutive Bitburger Open Grand Prix Gold titles from 2012 till 2014. Miss Chinese Taipei (or well-known as Miss Taiwan) is a national Beauty pageant in the Chinese Taipei since 1960.